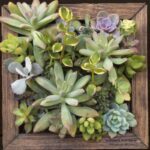 Types of Cactus and Succulents and some Bromeliads that we have grown over the years at our local California stores. This is not an Availability. We do not stock everything on this list. Cactus Jungle is a local nursery only, we do not ship plants.